Montoro, C., & Hampel, R., (2011). Investigating language learning activity using a CALL task in the self-access centre. Studies in Self-Access Learning Journal, 2(3), 119-135. This article describes a small study of the language learning activity of individual learners using a CALL task in a self-access environment. The research focuses on the nature of the language learning activity, the most salient elements that make up its structure and major disturbances observed between and within some of those elements. It is set in the context of computer-assisted language learning (CALL) and activity theory. A CALL task designed by the authors was made available online to be used as a research and learning tool. Empirical data was collected from two participants using ethnographic tools, such as participant observation and stimulated recall sessions. The analysis focuses on disturbances mainly involving the subject (i.e., the learner), mediating artefacts (e.g., the CALL task), the community (e.g., management and other self-access centre users) and the object of the activity (i.e., learning English). It is recommended that future studies should look deeper into contradictions in the learning activity from a cultural-historical perspective. Learners and practitioners involved in processes of second language teaching and learning increasingly draw on the use of computers and online resources that mediate the learning to a greater or lesser extent. Research in this area often focuses on certain aspects of the learning process, such as the impact these tools have on the learners, to the detriment of other contributing factors, such as the community (i.e., those who are also involved in the learning activity system, such as peers and the institution’s management), that make up a complex structure of activity where relationships between elements are dynamic, constantly shifting and occasionally contradictory, as shown below in this article. Therefore, a number of authors suggest that there is a need for research that captures the essence of the complex processes of learning rather than atomising the phenomenon under investigation. For instance, Ellis (2003) points out the lack of studies investigating tasks from a sociocultural perspective. In turn, Esteve, Arumí and Cañada (2003) argue for the need for empirical data. Benson (2007) draws attention to the scarcity of research on the use of self-study materials for self-instruction. Consequently, we aimed to address, from a sociocultural, activity-theoretical perspective, two fundamental questions in this study: (a) what is the nature and structure of the language learning activity of individual learners using a CALL task in the self-access centre and (b) what are the most salient disturbances (i.e., disruptions in the expected flow of learning actions) between and within the elements that make up the learning activity system. The research setting is one of ten new self-access centres recently opened by the University of Guanajuato (Mexico), where one of the authors works as a language adviser. The lack of real grounded knowledge of learner experiences and perceptions of learning languages in a self-access environment within the institution that seemed to accompany the expansion of language centres was one of the motivating factors of this study. The opening of the new self-access centres created new opportunities and challenges, such as the management and use of the state-of-the-art technology that came along with the new centres. Thus, a further source of motivation to conduct this study was the need to find out how learners would engage with the new technology. A CALL task was created by the authors to be used as a research and learning tool. As this study involved the use of computers, it was all too tempting to place the focus of attention on the ‘computer’ element of the activity. Although the online medium operates according to certain affordances (“the constraints and possibilities for making meaning”, Hampel, 2006, p. 111), computers are not necessarily the only or the most important element in the learning activity. Levy’s (2000) thorough investigation suggests that CALL research has often focused on the effectiveness of technological resources, such as CALL tasks; in other words, the effect of those resources (and technology, more generally) on the learner (e.g., Pellerin 1999). Notwithstanding the value of this kind of approach, our aim was not to find out the effect of one of the elements involved in the learning activity on another element, but to consider the relationships affecting all the elements and eventually concentrate on those relationships where disturbances were observed. However, the importance of a CALL task as a learning instrument cannot be ignored. Levy and Stockwell (2006) include CALL tasks under the umbrella of CALL materials, which they define as “the wide range of CALL artifacts or products that language teachers and designers create using technological resources” (Levy and Stockwell, 2006, p. 3). Given our focus on the learner, a CALL task is seen primarily as learning tool, as illustrated below. Nevertheless, as Gibson (1998) points out, technology does not have effects on its own; it depends on learners’ responses and learning environment, which includes the institutional context and its effect in terms of demands and constraints on learners (Laurillard, 2002). This study is based on the hypothesis that learners and their learning activity are influenced in a significant way by their sociocultural context. In line with both the broad sociocultural paradigm and activity-theoretical principles, we are assuming that any learning is embedded in sociocultural practices (Little, 1994) that account for how learners make sense of their learning experience, as opposed to the meaning others may attempt to impose on them. It is precisely how learners reach that personal, socially-constructed sense that we attempt to understand. For those readers not familiar with key activity-theoretical concepts, the assumption is that human activity is driven by needs that account for a general motivation. Motivation determines the orientation to tasks (Leontiev, 1978). Motives are socioculturally determined, as Wertsch, Minick and Arns (1984) demonstrate. Actions (“goal-directed processes”, Leontiev, 1978, p. 63) are directed by specific goals in the pursuit of a more general motive. Importantly, Leontiev states that an activity can be realised by performing different actions (i.e., in different ways). However, the conditions of the activity may change and thus require certain operations (“methods for accomplishing actions”, Leontiev, 1978, p. 65). All the above elements belong to the same system, that is, activity, which is the unit of analysis here, as opposed to other possible units, such as Human-Computer Interaction (HCI) (Kuutti, 1996), mediated action (Wertsch, 1995), task (Long & Crookes, 1993) or situated action (Lave & Wenger, 1991; Ohta, 2001). The validity of activity theory resides in the fact that it takes a holistic, thorough and systematic approach to analysis, which is not always present in CALL studies, as Blin suggests (2005). Activity theory argues (Leontiev, 1978; Vygotsky, 1987; Engeström, 1987) that human activity is mediated by cultural artefacts, which are culturally, historically and socially produced and reproduced, by means of complex and multidimensional relationships, as Figure 1 illustrates. In the case of language learners, their general motivation is a need to learn English. The goal can be something specific such as speaking. The mediating artefacts can be a CALL task (tool) designed to provide the learner with the opportunity to speak English and the language involved in completing the task (signs). Also key is the concept of agency, defined as “the ability and the need to act” (Kaptelinin & Nardi, 2006, p. 33) typical of human beings. What seems to be missing from the above structure is the social context, its rules and collaboration with others. In order to address this, Engeström (1987; 1999) developed the notion of activity further, adding more elements and complexity to the basic structure, as shown below (Figure 2). This complex structure of activity has been used to analyse and interpret the learning activity of this study, which is seen as a unique and unified whole. Definitions of tasks (Breen, 1987; Bygate, Skehan & Swain, 2001; Ellis, 2003; Klapper, 2003; Prabhu, 1987; Skehan, 1996) reveal some of the tensions underneath approaches focusing primarily on tasks as a unit of analysis. Firstly, most of them define task as an activity (or activities), providing no clear indication of how they interpret the concept of activity. Secondly, it is indeed worth noting that tasks are often described from the task designers’ perspective. Contrary to this, Ellis (2003, p. 5) and Breen (1987, p. 24) refer to a task as “a workplan”, suggesting that what is actually planned at the design stage may not coincide with what learners do with tasks. It might therefore be useful to establish a clear distinction between the task as a “behavioral blueprint” for learning or research purposes (Coughlan & Duff, 1994, p. 175) and the activity, that is, “the behavior that is actually produced when an individual (or group) performs a task” (Coughlan & Duff, 1994, p. 175). It is not tasks but rather what people do with tasks that generates learning: “tasks – or rather the activities that comprise participants’ task performances – serve as a form of mediation that can bring about learning” (Ellis, 2003, p. 178; added emphasis). Ellis himself specifically uses the term ‘the activity’ (Ellis, 2003, p. 180) later referring to what people do with tasks, as do Oxford (2006) and Beetham (2007). Activity may be defined as “the purposeful interaction of the subject with the world” (Kaptelinin and Nardi, 2006, p. 31). In this case, learning activity refers to “a specific interaction of learner(s) with other(s) using specific tools and resources, orientated towards specific outcomes” (Beetham 2007, p. 28). Thus, the assumption in this study is that discrepancies between the expectations of language teacher-designers and learner behaviour represent initial ports of entry into the analysis and understanding of the learning activity under study. Such discrepancies are captured by Engeström and Sannino’s (2011) concept of disturbances, defined as “deviations from the normal scripted course of events” (Engeström & Sannino, 2011, p. 372). Engeström and Sannino’s concept from organizational studies has been applied to this study to analyse disturbances as deviations in learner behaviour from the language teacher-designer’s expected course of events. Two female digital arts students, Isabella and Núria (not their real names), were chosen as learner-participants. The authors of this paper acted as teacher-researchers. The research setting was a self-access centre located at the remote and isolated Salamanca site of the University of Guanajuato (Mexico), offering undergraduate and postgraduate programmes in the areas of engineering, business, English language teaching and digital arts. The layout of the self-access centre is shown in Figure 3. The study consisted of Núria and Isabella engaging with a CALL task (henceforth referred to as “the task”) on the 5th and 10th November 2009 respectively, with stimulated recall sessions following a day later. The task, designed by the authors, required the learners to introduce themselves on video. It included support tools (electronic and otherwise) available to them online and in the self-access centre. The duration of the task was estimated at 90 minutes. The task was made available on the institution’s electronic platform, Blackboard, which the learners were familiar with. 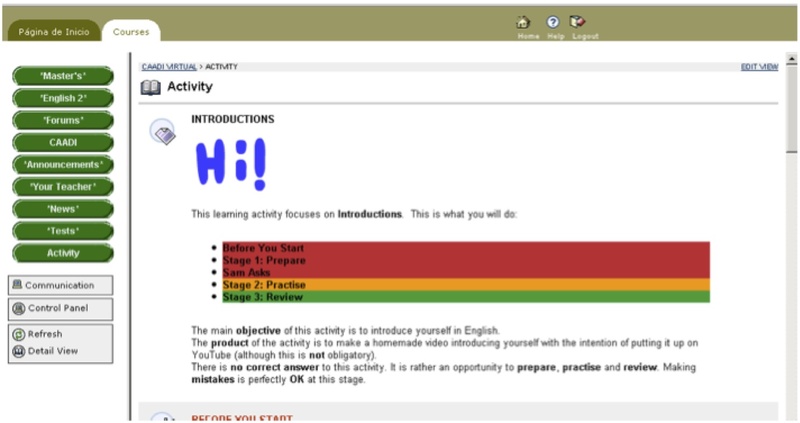 Figure 4 is a screenshot showing a part of the task as it was presented to the learners. A YouTube video represented an idealised version of the task’s expected outcome. In designing the task, Ellis’ (2003) criterial features of a task and Chapelle’s (2001) six criteria for CALL task appropriateness were used. Wood, Bruner and Ross’ (1976) forms of scaffolding were also considered. An ethnographic, process-oriented, participatory, activity-theoretical approach was adopted in this study. Our focus was on learners and their interaction with a CALL task, in other words, on the learning process, and not the product. A desire to give learners a voice led us to choose a participatory research design. Activity theory gave this study direction because its cyclic nature makes it fit to understand the “transformations at the individual level, emphasizing the internalization of culturally given higher psychological functions” (Engeström, 1999, p. 35). The research methods used in the study were essentially qualitative (learner observation being our primary data source), in line with our interest in learners and what they say and do during their learning activity. During the experiment, data collection methods included recordings of computer-screen learner activity, webcam recordings of learner behaviour and utterances, and field notes. Other data-collection tools included a stimulated recall session (Gass & Mackey, 2000) with each individual participant after they completed the task. In the session, learners were presented with recall support in the form of a video recording of their performance, which was discussed in conversation with the researchers. Data analysis was conducted using the complex structure of activity (see Figure 2) and activity theory concepts described earlier. The subject was each of the learners, Núria and Isabella. As for the object, the overall motive was learning English, whilst the specific goal set for the learner was oral practice for which the participants had expressed their preference earlier. Accordingly, the proposed outcome of this particular task was to create a video where the learners had to introduce themselves in English. Several tools or mediating artefacts were available, such as the computer, linguistic forms, the CALL task, online and physical dictionaries as well as other self-access tools and resources. Support was available within the community in the form of online and face-to-face teacher and peer support. There were a number of rules in place, such as time-limits (90 minutes to complete that section) and other task instructions, affordances of the self-access and online environments that shaped what learners could do, societal conventions that apply to meeting people and introductions, and the grammaticality of the language used. The community consisted of the teacher-researchers, stakeholders, peers, self-access centre staff, IT staff and the institution’s management. Additionally, imaginary English-speaking interlocutors (for instance, potential YouTube viewers) may also have been present as part of the community in the minds of the learners, affecting their behaviour and performance during the learning activity. The division of labour involved the teacher-researchers designing the task in advance, setting up the necessary software and hardware and being available during the task to provide support and after it to give feedback; the learners had to complete the task; peers could provide support if needed; self-access centre staff and IT staff helped during the set-up stage and were also available to provide support while learners engaged with the task. A number of disturbances observed between and within some of these elements are described below. In relation to the affordances of the online medium, closely linked to the use of a CALL task as a mediating artefact, some stability and reliability issues with Blackboard, the electronic platform hosting the task, became evident when Núria and Isabella had to send a questionnaire (included in the task) three times each, which involved retyping their answers with each new attempt, before it went through successfully in the case of the former (Isabella never managed to complete the task). As a result, the participants’ stress and frustration levels increased as it became impossible for them to complete whole sections of the task. This suggests that there is a disturbance affecting the triangle consisting of the mediating artefact, that is, the task, the institution’s decision makers as members of the community who have a bearing on IT provision, and the object of the learning activity, as shown in Figure 5. Another instance of this kind of disturbance was Núria’s attempt to open the chat-with-your-teacher application, which took 12 minutes to get established. What should have been a simple routine operation (i.e., asking a question online) became a labour-intensive action in response to unforeseen unfavourable conditions of this particular online medium. Later, Núria tried to open ebbudy.com, a web-based messenger application, to contact graduate friends who are more proficient in English (instances of more capable peers in the learning activity’s community) in case she needed help with the task; however, she could not get it to open due to connectivity issues. Likewise, learners could not watch the YouTube video provided as the task’s input nor could they use a recommended online dictionary application. Disturbances may also have existed at the level of the division of labour, as qualified IT support staff provision is less than adequate, although this arguably goes back to strategic decisions made by the institution’s management. As Laurillard (2002) argues, the institutional context has an impact on the learner context and learners’ responses. This is an area that deserves further analysis in future studies. Unlike Núria, Isabella was seen constantly reading out loud (which she later admitted to doing generally, not just when studying English). This could be a sign of what Vygotsky understands to be an intermediary stage prior to reading “in the head” and therefore a sign of underdeveloped literacy skills. A couple of months later, this issue was discussed with Isabella during an informal conversation in an attempt to raise her awareness and let her reap the benefits of taking part in the study. A similar issue was Núria’s refusal to write anything down in preparation for her video presentation. She later explained that she had been rehearsing what she was going to say in her video “in her head” on the bus, on her way to university, by remembering things she had already seen in class and lyrics from songs in English she often listens to. This appears to be a good example of dynamic shifts between inner speech and social speech, as described by Vygotsky (1987). On a practical level, most of the vocabulary she was going to use came from oral input sources, and was going to be used orally again in the task, which might explain her resistance to write down the vocabulary beforehand because, as she admitted, she could not even spell some of the words she was planning to use. However, the causes may also be connected to deeper systemic contradictions of a cultural-historical nature that could be revealed in future studies. In turn, Isabella did not make any notes either, which compounded with her level of stress resulted in her tendency to forget the meaning of words that she had just checked minutes earlier. An interesting turning point was her decision to abandon the Google translate tool she was using and pick up a physical dictionary from a self-access centre shelf instead. She found the latter helpful because it offered more than word-for-word correspondences, such as notes on usage. Days later she came back to the self-access centre to make a note of the bibliographical details of the dictionary in order to buy it, which could mean that this experiment was formative in the Vygotskian sense after all and brought about desirable change at an individual level. Disturbances were observed too between the subject, the community of peers in the self-access centre and the object (Figure 6). Núria’s data shows that before she started speaking she looked around her in the self-access centre because she anticipated feeling self-conscious speaking within hearing distance of others. A similar feeling was echoed by Isabella, who was distracted by another self-access centre user who talked to her for seven minutes before she could begin work on the task, adding extra pressure to her limited time availability. The noise level in the self-access centre also affected Isabella, who whispered “Oh, shut up!” (Isabella experiment data) at one point when another user started speaking loudly nearby. The relationship between the participants and other self-access users seemed to play a significant role affecting the object of the learning activity (see Figure 6). By the time Núria and Isabella moved on to a grammar section of the task, it was evident by observing their facial expressions and deep sighs that they were overwhelmed by the complexity of the task. This issue seemed to be related not only to the actual learning environment but also to the overambitious design of the task and it informed changes we made to the task design subsequently. This is a clear sign of a disturbance existing between the subject, the task as a mediating artefact and the object, as shown in Figure 7. To summarise, we would like to highlight a number of key findings and point out some limitations. Firstly, the study has shown the potential value of using activity theory to analyse the various elements of the language learning activity and focus on the disturbances within and between elements as they emerged during the activity. Secondly, in terms of task design, the analysis of disturbances has revealed the complexity of designing and using a CALL task. In future designs, simpler task stages and more support seem necessary to control learner frustration, especially in a context where the technology available is not fully reliable. Thirdly, in online and self-access environments, support is key (Benson, 2007, pp. 26-27, Ohta, 2001, p. 10). Hence, researchers may do well in conducting further analyses of the relationship between the subject (the learner), the mediating artefacts (especially the CALL task, but also the support tools such as dictionaries) and the object (learning English). Our study of only two individuals may raise questions about its generalisability. Although this small study had no aspirations for generalisability, further research should be conducted with larger samples in order to address this issue. As for our analysis of a single episode of learning activity, such a short timescale has been criticised by some authors (e.g., Lemke, 2001). Indeed, future studies would do well in engaging in a cultural-historical analysis of the institution in its context over a greater timespan to gain insights into collective practices and developmental issues. In short, the findings from our study could be the starting point for future large-scale projects. Looking for deep-seated, systemic contradictions and exploring neighbouring activities, such as the institutional activity and the teaching activity, may prove to be productive avenues. Carlos Montoro is a Lecturer and a self-access centre adviser at the University of Guanajuato, Mexico. He is currently pursuing Doctorate in Education (EdD) studies at the Open University (UK). His research focuses on the use of online tasks in language learning from an activity-theoretical perspective. Dr. Regine Hampel is a Senior Lecturer in Modern Languages at the Open University (UK) and Director of Postgraduate Studies at the Centre for Research in Education and Educational Technology. She has published widely on the use of technology in the context of language learning and teaching. Her current research focuses on Computer Mediated Communication (CMC), Virtual Learning Environments (VLEs) and the use of audio and videoconferencing and other online tools in educational settings. Beetham, H. (2007). An approach to learning activity design. In H. Beetham & R. Sharpe (Eds.). Rethinking pedagogy for a digital age: Designing and delivering e-learning (pp. 26-40). London: Routledge. Benson, P. (2007). Autonomy in language teaching and learning. Language Teaching, 40(1), 21-40. Blin, F. (2005). CALL and the development of learner autonomy: an activity theoretical study. Unpublished PhD Thesis. Milton Keynes: Open University. Breen, M. (1987). Learner contributions to task design. In C. N. Candlin & D. Murphy (Eds.) Language learning tasks (pp. 23-46). Englewood Cliffs, NJ: Prentice Hall. Bygate, M., Skehan, P., & Swain, M. (Eds.) (2001). Researching pedagogic tasks, second language learning, teaching and testing. Harlow: Longman. Chapelle, C. A. (2001). Computer applications in Second Language Acquisition: Foundations for teaching, testing and research. Cambridge: Cambridge University Press. Coughlan, P., & Duff, P. A. (1994). Same task, different activities: Analysis of a SLA task from an Activity Theory perspective. In J. P. Lantolf & G. Appel (Eds.) Vygotskian approaches to second language research (pp. 173-193). Norwood, NJ: Ablex. Engeström, Y. (1999). Activity Theory and transformation. In Y. Engeström, R. Miettinen & R.-L. Punamäki (Eds.) Perspectives on Activity Theory (pp. 19-38). Cambridge: Cambridge University Press. Engeström, Y., & Sannino, A. (2011). Discursive manifestations of contradictions in organizational change efforts: A methodological framework. Journal of Organizational Change Management, 24(3), 368-387. Esteve, O., Arumí, M., & Cañada, M. D. (2003). Hacia la autonomía del aprendiz en la enseñanza de lenguas extranjeras en el ámbito universitario: el enfoque por tareas como puente de unión entre el aprendizaje en el aula y el trabajo de autoaprendizaje. BELLS. Barcelona: Publicacions On-line de la Universitat de Barcelona. Gass, S. M. & Mackey, A. (2000). Stimulated recall methodology in second language research. Mahwah, NJ: Lawrence Erlbaum Associates. Gibson, C. (1998). The distance learner in context. In C. C. Gibson (Ed.) Distance learners in higher education: Institutional responses for quality outcomes (pp. 113-125). Madison, WI: Atwood Publishing. Hampel, R. (2006). Rethinking task design for the digital age: A framework for language teaching and learning in a synchronous online environment. ReCALL, 18(1), 105-121. Kuutti, K. (1996). Activity Theory as a potential framework for Human-Computer Interaction research. In B. A. Nardi (Ed.) Context and consciousness: Activity Theory and Human-Computer Interaction (pp. 17-44). Cambridge, Mass. : The MIT Press. Laurillard, D. (2002). Rethinking university teaching. A conversational framework for the effective use of learning technologies (2nded.). London: Routledge. Lemke, J. L. (2001).The long and the short of it. Comments on multiple timescale studies of human activity. The Journal of Learning Sciences, 10(1&2), 17-26. Leontiev, A. N. (1978). Activity, consciousness, and personality. Englewood Cliffs, NJ: Prentice Hall. Levy, M. (2000). Scope, goals and methods in CALL research: questions of coherence and autonomy. ReCALL 12(2), 170-195. Little, D. (1994). Learner autonomy: A theoretical construct and its practical application. Die NeuerenSprachen, 93(5), 430-442. Long, M. H., & Crookes, G. (1993). Units of analysis in syllabus design – the case for task. In G. Crookes & S. M. Gass (Eds.) Tasks in a pedagogical context: Integrating theory and practice (pp. 9-54). Clevedon, Avon: Multilingual Matters. Ohta, A.S. (2001). Second languageaAcquisition processes in the classroom: Learning Japanese. Mahwah, NJ: Lawrence Erlbaum Associates. Oxford, R. (2006). Task-based language teaching and learning: An overview. Asian EFL Journal, 8(3), 94-121. Pellerin, M. (1999). Ordinateurs: Effaces ou pas? (La perspective d’une enseignante). Computer Assisted Language Learning, 12(4), 381-390. Skehan, P. (1996). A framework for the implementation of task-based instruction. Applied Linguistics, 17(1), 38-62. Vygotsky, L. (1978). Mind in society. The development of higher psychological processes. Cambridge, MA; London: Harvard University Press. Vygotsky, L. (1987). The collected works of L. S. Vygotsky. Volume 1. Problems of general psychology: including the volume Thinking and speech. New York, NY: Plenum Press. Wertsch, J. V. (1995). Mediated action and the study of communication: The lessons of L. S. Vygotsky & M. M. Bakhtin. The Communication Review, 1(2), 133-154. Wertsch, J., Minick, N., & Arns, F. (1984). The creation of context in joint problem solving. In B. Rogoff & J. Lave (Eds.) Everyday cognition. Its development in social contexts. Cambridge, MA: Harvard University Press. Wood, D., Bruner, J. S., & Ross, G. (1976). The role of tutoring in problem-solving. Journal of Child Psychology & Psychiatry & Allied Disciplines, 17(2), 89-100. Language teacher-designers refers to practitioners “who are increasingly required to create online materials for independent study or distance learning” (Levy & Stockwell, 2006, p. xii) and captures the ‘practitioner’ role of the authors of this study well. Later on in the article, the term teacher-researchers is used to reflect the increasing relevance of their ‘researcher’ role.